Traveling through the I-95 corridor typically comes with its fair share of headaches, often at the hands of some kind of traffic mishap. Whether there’s been an accident or if traffic slows to a halting crawl, there’s inevitably going to be some sort of traffic related situation that’s going to bog you down. Traffic delays can turn your four or five-hour trip into an epic journey (or at least a major headache). Your best bet at avoiding such a mess is to tune into the local I-95 traffic update report so you know where the trouble will be and (hopefully) avoid it. Part of the problem is that the I-95 interstate runs the entire length of the East Coast—which means the traffic report (and the radio station you need to tune to) will change pretty frequently. For that reason, we’ve got a few resources for traveling I-95 to keep you informed on upcoming traffic and moving forward at a solid pace. Here’s where you can find a traffic update in the busiest metro areas along the interstate. In 2010, I-95 through Miami was the deadliest stretch of highway in the United States (named so for the number of traffic-related fatalities). Needless to say, traffic here gets really bad. Don’t be caught by an unexpected accident on the road. Tune into 610 AM. When it comes to traffic on I-95 , you won’t have too much trouble south of the Virginia capitol. While traffic here isn’t often bad, it can cause a delay and there are easy routes to avoid any traffic you might come across in Richmond. These short-range AM radio stations are part of the VADOT traffic monitoring system and are aimed specifically at drivers. The updates are frequent and you’ll get nothing other than traffic data on these channels. The downside is that they are read to you in an automated robot voice that can get pretty tiring if you have to listen to too many cycles. Welcome to I95 traffic hell. A word of warning, if you can bypass the beltway (and the area between D.C. and Fredericksburg, VA), do so. Even if you think it will add an hour to your drive, we promise that adding an hour to your commute is still a time savings when it comes to this stretch of I-95. If you must involve yourself in this traffic mess, this station will at least keep you informed of why you’re barely moving on the interstate. If you’re traveling between two points at either end of I95, then the Philly metro area is your breather. Traffic here is pretty smooth sailing by comparison. Of course, now that we’ve said that, we’ve jinxed it and you’re probably now sitting in the worst traffic jam the city has seen in 20 years. Sorry about that. This won’t make it any better, but at least you’ll know what the holdup is if you turn your radio dial to 1060 AM, the Philly metro traffic report. The New Jersey Turnpike is renowned for being a hot mess in terms of traffic, but at least here you know to expect it. The New Jersey Turnpike Authority knows, too. They’ve got a large number of live-feed video cameras monitoring all the major sections of the highway—something local traffic reporters are quick to use. The local top pick for traffic reports is 101.5 FM. They offer a traffic report every 15 minutes, which is about how quickly things can change on this highway. While it’s not the worst place for traffic on this list, the New York City stretch of I95 is prone to changing with only a moment’s notice and what might be a small issue on other parts of this interstate become more troublesome here. These two stations will keep you well informed. 880 (WCBS) delivers traffic on the 8’s and 1010 (WINS) delivers traffic reports on the 1’s. If you’re driving through, it’s wise to keep one or both of these programs for quick and easy access. Compared to some of these other metro areas, the Boston stretch of I95 is pretty tame. Weather conditions can make things a bit uncomfortable for those of us who hail from further down south, but sleet and snow aside, this bit of highway is smooth sailing. Still, it’s always a good idea to have the traffic report easily accessible. You can expect traffic reports on the 3’s. The local CBS affiliate seems to be the best source of traffic reports in the state. There are some local players, but WTIC—a news talk radio station based in Hartford, CT—seems to come to the top of the list. Outside of the traffic hysteria of the NJ to Northern NY stretch of I95, Connecticut’s stretch of I95 is reportedly hit or miss. There is often traffic, but it isn’t too bad, comparatively. However, traffic can occasionally get out of hand and when that happens, WTIC 1080 AM is the place to turn for reliable and timely traffic reporting. 1190 KEX in Portland is your best bet for reliable and timely traffic info in the Portland, ME metro area. This section of I95 isn’t especially congested, particularly compared to other metro areas. 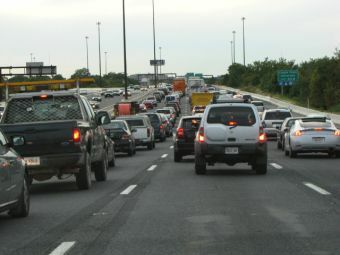 Weather is the main concern here and, similar to Connecticut, one accident has a tendency to jam up the works and cause delays. Can’t Find the Right Station? If you can’t find a traffic radio station or you can’t get clear reception, don’t worry. There’s plenty of other ways to get the scoop on traffic in your area. For the entire I-95 corridor you can dial #511 on your phone for traffic and travel information (we recommend pulling off the highway to make your call). There are also a large number of traffic apps, some of which we’ve already covered, to help you stay abreast of traffic conditions. Just remember to install your app before you hit the road so you can get all of the latest I-95 traffic updates.